Scooter by the Sea: Lob-Stah!!! You may have read about the glut of lobsters being caught off the coast of Maine, resulting in what one lobster fisheries spokesperson called "the lowest prices in a generation." And as you can see below, this store in my area is selling soft shells for $3.99 a pound. Soft shell lobsters have recently molted - shed their old shell when their bodies outgrew it - and are rattling around in a new house too big for their skinny bodies. Hard shells are tightly packed, like a fat man who desperately needs to upgrade to bigger pants. 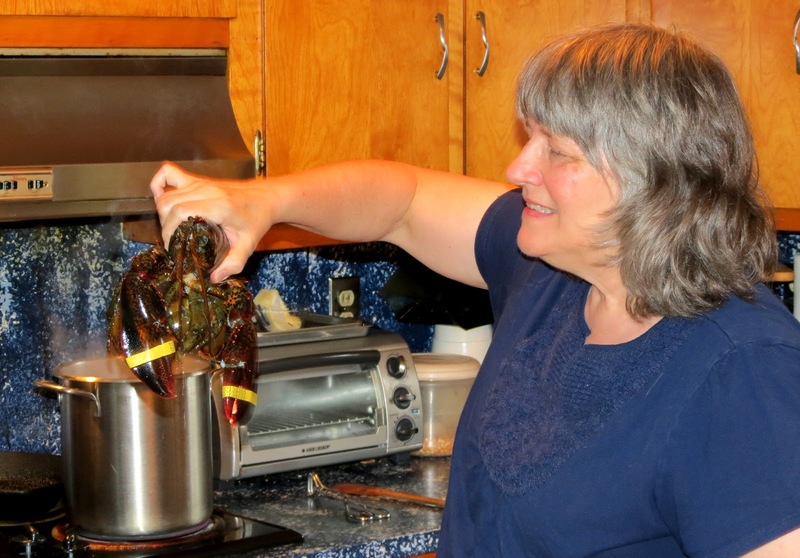 So, soft shells have less meat, hard shells have much more. BUT - the soft shell meat is sweeter than the tougher hard shell. In the opinion of my dear wife Kathy, the more abundant but less tasty meat of hard shells isn't worth the $4 a pound difference. Hauling the big fellas out of the water is no easy task - frankly, the ugly creatures would rather remain wet. Before cooking them, my wife likes to play with her food. Rosie - the cat on the left - understands that the rubber bands on the claws render the lobster harmless. 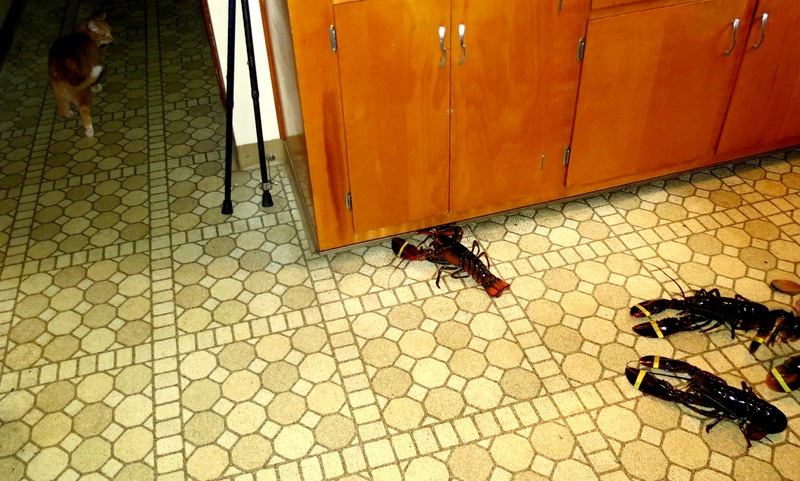 Teddy Ballgame, the cat disappearing down the hall, feels under attack, despite the banded claws and the fact that lobsters move like slugs when out of the water. 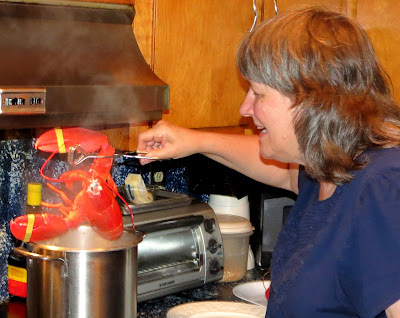 Fun time over, Kathy is ready for the serious work of dunking dinner into a pot of boiling water. Note that she wears an expression of "Yuck - this is gross!" Twenty minutes later, and the memory of plunging a living creature into boiling water is replaced by the anticipation of a most tasty treat. Just a couple of years ago, these pound and a half lobsters would have cost up to $10 a pound, and the hard shells even more. 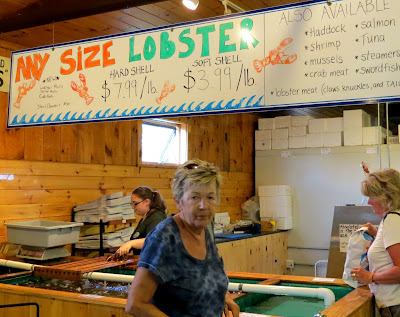 So, at under $4 a pound, you can understand why lobster is very frequent dinner fare throughout Maine this summer. 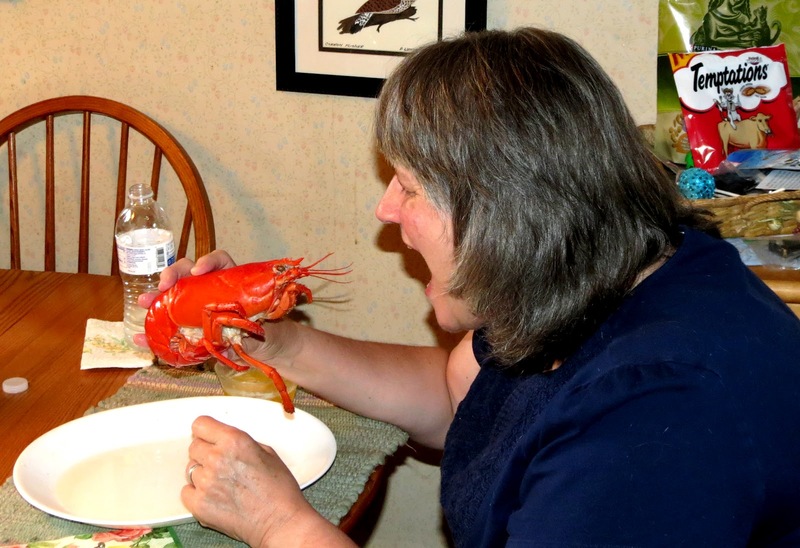 There are many ways to eat a lobster. This isn't one of them! Kathy is surprised to see Teddy back - he who so recently fled from the Attack of the Living Terror from the Deep. Now, he wants to share. "Don't eat from my plate," bellows my sweet-tempered wife. This is Kathy's best-selling painting, named "Lobster Love." These are a pair of my favorites. 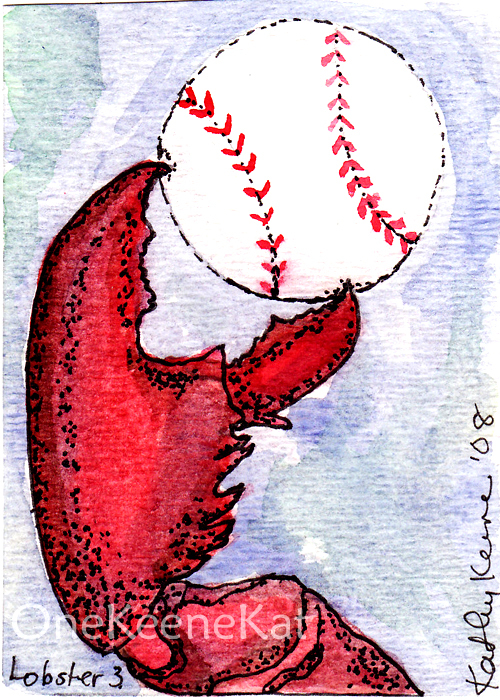 I think the lobster is about to toss a knuckleball. Mmmmmm! Yes, the lobstah was good! The prices were/are unbelievable. 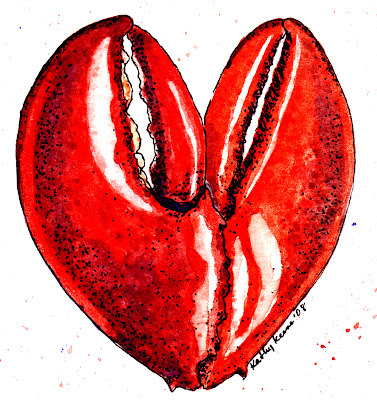 The lobsters running loose is a tradition from one of our favorite movies: "Annie Hall." The scene when Woody Allen and Diane Keating have a bit of trouble cooking lobsters has led us to recreate the scene endlessly. Kathy is a really talented artist, and she will appreciate your comment when she sees it. I am assuming Kathy sells her artwork? Is there an online site or something? If I had known I would have pestered you while we were there. I love to purchase work from local artists. Especially on vacation. 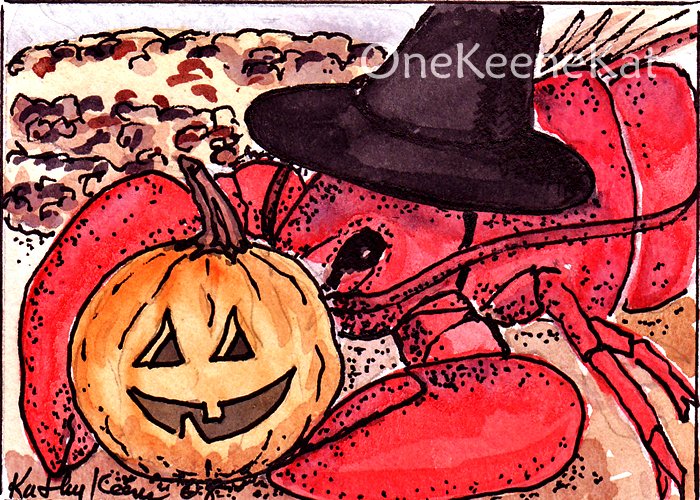 I would love to purchase something of the lobstah variety for our Maine remembrance. How can I? And Kathy's art is excellent. 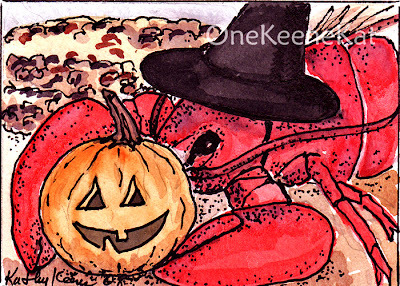 I love Halloween, so that painting really appeals to me. If we had lobsters here in WI I'd offer to be her agent! 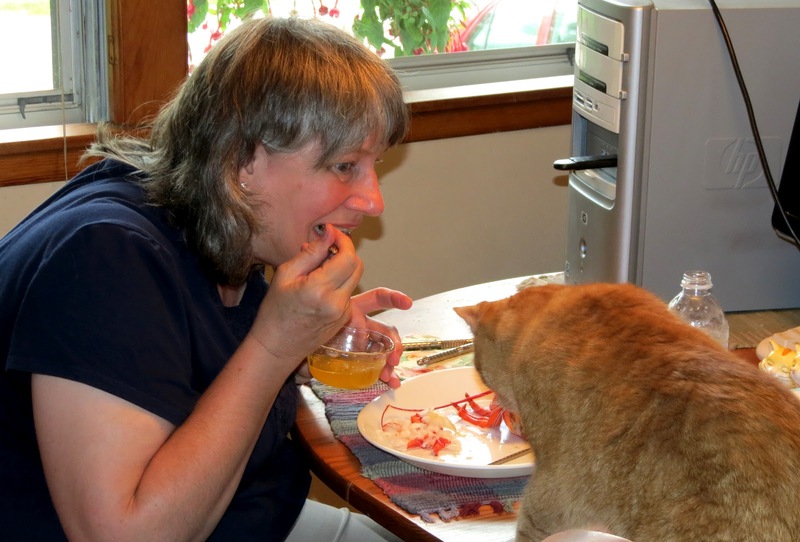 "Don't mind another cat, fat boy, and even another human is ok. But that - THING - is out of bounds. Call me when it's cooked. We'll share." I love your work. So cute! I'll be ordering. Sorry we didn't get the chance to meet you while we were up there! Bring your husband to dinner someday soon. 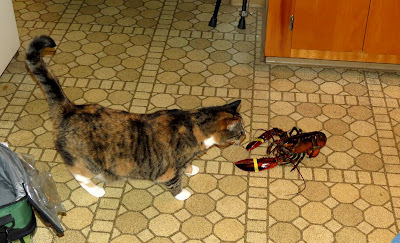 We'll have lobsters with tomatoes! I think you two had entirely too much fun playing with your food, but then that is what life is about. Eating and enjoying life. I too love Kathy's paintings. I now need to count my pennies and head to the Etsy store to see what I can see. 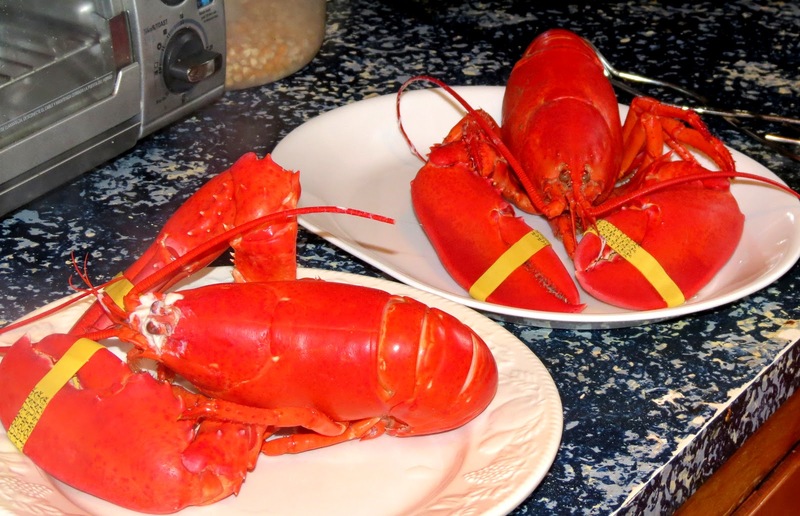 In Asian restaurants they are at least $16.per lb, so a lobster dish costs around $50.00 cooked and served. when we were in NewFoundland a few years ago there was not a lobster to be found, and now you tempt us with $3.99 / lb. how cruel. 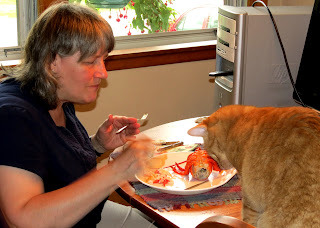 I have had so much Lobstah this summer that I am ALMOST tired of it.